Boring tours aren't fun, Rome is a unique city & I want you to experience it the way I do: as a historian, as an art lover but most importantly as a local! ”My first visit to Rome was made special by Isotta’s Urban Baroque Walking Tour, plus a visit to St. Peter’s Basilica! Her delightful personality and knowledge of art and architecture produced a wonderful afternoon of touring. Now I can tell my friends the difference between fresco and oil painting, or Doric vs Corinthian columns. Love having children on tours as well! Catherine and Elizabeth are 5 and 8. 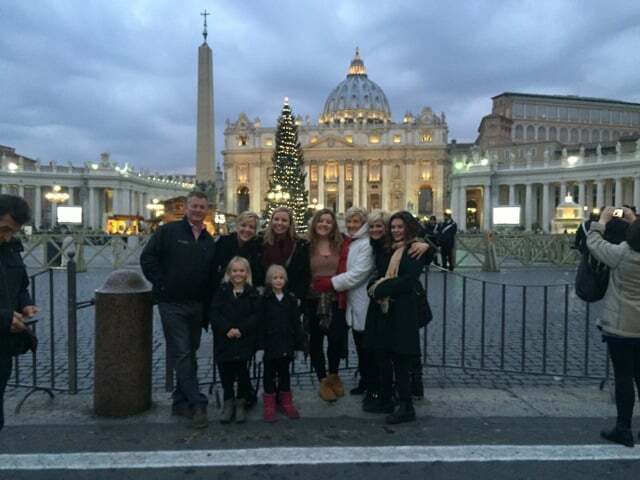 To make your time in Rome as enjoyable & exciting to all members of your group, I can create a personalised tour tailor fit to meet all of your families wishes. Contact me directly with your destinations of interest & I'll incorporate them into our day to ensure that all stops will be fun, while at the same time enhancing & adding to your understanding of Rome's immense culture & history. Please get in touch with questions and ideas! I would love to discuss your thoughts & hear your wish list about your visit to Rome. Experience the breathtaking Vatican Museums complete with Classical Statuary, Raphael's masterpieces and of course the magnificent Sistine Chapel. A Baroque gem of the city, the Vatican Museums are a maze of historical anecdotes and masterpieces, destinations and tickets will be selected and booked in advance to avoid tiresome lines and soar feet from too much walking. After the Museums we can stop for a local lunch and then carry on to visit the St.Peter's Basilica, the most important church in the world! Explore three Baroque churches in the centre of Rome, each containing masterpieces by Borromini, Caravaggio and Pieter Paul Rubens. Understand and observe the works in their original context in order to experience the unchanged atmosphere of these Roman churches since their general completion in the mid 17th century. Afterwards stroll through Piazza Navona and enjoy Bernini's colossal sculptures and flowing fountains. To finish off we'll stop nearby away from the hustle and bustle for a snack or aperitif in local restaurants and bars. Begin the day with a beautiful walk through Rome's largest park Villa Borghese, then enjoy a guided tour of the the worlds first museum! The Borghese gallery contains a marvellous collection of Renaissance and Baroque masterpieces collected by the infamous Cardinal Scippione Borghese. Experience the works in their original location and explore the luxurious gallery in all of its grandeur and fame, we will focus on Bernini's mythological sculptures which are breathtaking and, my personal favourites! This tour is rather untraditional and is geared towards shopping and experiencing local life. We will explore various neighbourhoods in the centre of Rome and search for beautiful used or vintage garments and objects. Starting in Governo Vecchio and making our way over towards the Monti and Celio area you are certain to pick up a few great items while exploring Rome and of course stopping for pizza or gelato when necessary! This tour begins in the 17th century underground Capuchin Crypt a six room complex adorned entirely with the remains of devoted friars of the Capuchin order. Skulls, bones and teeth construct arches, altars and chandeliers a gainly sight described by Hawthorne as "one of the most horrifying images in all of Christendom". From this far from traditional site we will move onto two tiny churches, both architectural and stylistic gems of the Baroque style. After visiting Bernini and Borromini's churches we will walk towards the Quirinale and meander down to the Trevi Fountain and towards the magnificent Spanish Steps and Piazza del Popolo. In the hot summer months its wonderful to enjoy some of Rome's less crowded spots. To begin the tour we will take a wander through the Palatine Hill a green space adorned with the ruins of palaces belonging to Ancient Roman Emperors, this site complete with scenic views is great for children and adults alike. The contrast between ancient and natural elements is unique and breathtaking. From there we can wander towards the Circus Maximus, the ancient Roman race track where gladiators once rode horses and carriages to entertain the citizens of Rome. We could then stop for a simple lunch or continue our walking through the lovely Roman rose garden and up into the Aventine hill. There we will visit the remarkable key hole, where a lovely view of the Vatican can be enjoyed, and stop by some beautiful monastic churches and parks. While Rome may contain the seat of the Catholic Church, the city also has a vibrant, long-standing Jewish history—particularly in the Jewish Ghetto and Trastevere neighbourhoods. The Jewish Quarter in Rome is small but very rich both in culture and cuisine. This tour will guide you through the Jewish history of Rome and expose you to the magnificent and unique flavours of Roman cuisine! We will dine at one of my all-time favourite restaurants Nonna Betta and experience the unique bridge between Middle Eastern and Italian flavours. After lunch we will stroll through Campo di Fiori catching the end of the daily market and continue our walk on one of Rome’s original Pilgrim routes to the Vatican. On the way, we can glance at the lovely boutiques and shops that contain only unique collections and original antiques. Jed and I inside St.Peter's Basilica!